Say Goodbye to Beige and Hello to Gray! Is your beige feeling a lil’ blah? Are your bored with the warm Tuscan glory of your earth-toned inspired home? Join the club. And while it’s not a club I have jumped into wholeheartedly myself, it is one that HUNDREDS of my clients have joined, with the hopes of creating a more fresh, vibrant, modern home. Remember, beige is a neutral and neutrals are about as flexible as a 10-year-old gymnast. So, while you may feel limited, you actually have a WORLD of colours available to you-you just need to know which direction to go in. If you subscribe to my free blog updates (drink the Kool-Aid – it’s gooood), you are probably aware of the fact that grays have undertones – I refer to them ALL the time (along with red wine, dogs and mildly inappropriate topics). Undertones are those sneaky ‘colours’ that can rise up once you’ve painted a wall with 2 coats and step back in your all of your sweaty, exhausted glory to realize that your gray walls actually look blue or your beige walls really look pink. So, the key to choosing the best gray is to figure out which undertones you are dealing with and which ones best suit your home, furnishings and personal tastes. These grays have blue, purple or green undertones (blue and purple being the most common). Read more about gray undertones here. Cool grays can look really good with beige, however, I’ve found that the warm undertones that are often found in beige (yellow/orange/red) can be ENHANCED when you paint the walls a cool colour. Opposites attract, so your warm beige carpet may look more pink or yellow if you paint the walls a cool, blue base gray. Your carpet will ALSO enhance the cool tones in your paint colour. Now, this isn’t a BAD thing, it can look SUPER sharp, but I’ve found that most of my clients and readers are looking for a more subtle, modern, less colourful approach, which leads us to warm grays. These have a weee willy wink of brown in them and can often come across slightly purple, taupe or green. Warm grays tend to look good with beige, simply because they BOTH have brown in them. Beige is basically a light brown and warm grays have a touch of brown in them. The more brown you add, the closer you get to greige, which is also a fab choice when updating a beige home. These are grays that are mixed with a good dose of beige and tend to have less undertone compared to warm grays and cool grays. Greige is a great colour to transition from gray to greige as it has both gray and beige in it – in decent doses. Is it as cool/gray as you were maybe hoping for? Probably not, but it can often be a great ‘happy medium’ between where you ARE and where you want to BE (other than on a hot tropical island with Ryan Reynolds in a speedo). Read more: Taupe and Greige – What’s the Big Difference? I’ve found that homes with beige in them often don’t suit the off-white/light range of the above colours. It’s like everything gets a bit too washed-out and non-committal. And while there is the odd exception, it seems that most rooms with beige in them best suit paint colours in the light/medium to dark range when it comes to transition time. When choosing a colour, you can get some good insights into how it may look via its LRV. If you don’t what LRV is, it’s Light Reflectance Value and to keep things simple, it basically tells you how light or dark a colour will look once it’s up on the wall. (Read ALL about it here – The Ultimate Guide to LRV). In my Online Colour Consulting, I usually refer to colours that have an LRV of 60 or lower when I’m coordinating with beige. Once I get into the higher LRV’s (approx. 65+), things don’t seem to connect quite as well. Now I KNOW you are just begging me to mention some actual paint colours, but here’s the deal Ally McBeal. I created my blog posts to give you free access to information that is helpful and will get you off on the right foot. If you need help from there, I’m MORE than happy to give you suggestions via my Online Color Consulting which is affordable AND fun AND personalized to the specific needs of your home and your tastes. So, while I’d love to throw a riot of colours at you, a gal needs to bring home some BACON ya know?! Want to create your DREAM room? Check out my E-Design and Online Colour Consulting Packages! Kylie M Interiors Interior Decorating and Design Blog E-Design, Virtual Consulting and Online Colour Consulting Services Based in Nanaimo, Vancouver Island and serving the whole darned world! Hi Kylie. This is probably a strange question, but I haven’t been able to find the answer so I am hoping that you will know. I am growing my gray hair out, no more coloring for me. I am updating my wardrobe to reflect this change, no more warm colors for me. My question is, do I have to change my home’s interior colors also? I still love my beiges, olive greens, gold and travertine. What is your opinion? Okay, so I’m no wardrobe expert, but I’ve found that what suits us for clothing is not just about hair colour, but about skin tone, so I would probably pay attention to that first and THEN the hair colour (as gray can be VERY flexible, whereas skin tone isn’t always as flexible). When it comes to ALL of this, it’s about what you feel BEST in, not just wardrobe wise, but home-wise – and these DON’T have to be the same! I find that the clothing I feel the best in are colours that I wouldn’t wear at all – things just feel differently to me going from walls to t-shirts. You might find that your skin tone (relating to wardrobe) still likes those warmer colours. Or maybe you switch to cooler colours, but you do the ‘autumn’ version of cool colours, so that they aren’t COLD colours and are a bit softer (BM Smoked Oyster and Carolina Gull would be good examples of this) and these colours will work with your olive greens/gold/travertine as they are all in the ‘earth-toned family’. It’s when you take the ‘earthy tones’ out of the, that they become more cold and icy (ie: a more genuine blue/purple/green without any gray or brown in it). If you take the gray/brown out of those cool colors, there could be a disconnect between wardrobe/home. The fact that you say you still love your beige/olive/gold means to me that you should KEEP them and just tweak your wardrobe so that they are in the same family! I hope that gives you some food for thought! Hi Joyce! I know, it’s hard to imagine that it works…but it does! The thing is, not only have I done thousands of e-designs, but I spent years in local homes, getting to know exposures/products/sizes. This means that when I look at your photos I have a pretty good idea of what I’m seeing, based on my hands-on experience. I’ll give you 3 options and explain them, so you can understand them. Plus there’s a follow-up email so we can tweak things if needed! I hope that eases your mind a bit, I’d love to help! In a new construction I’ve chosen White Viscon granite with white kitchen cabinets. 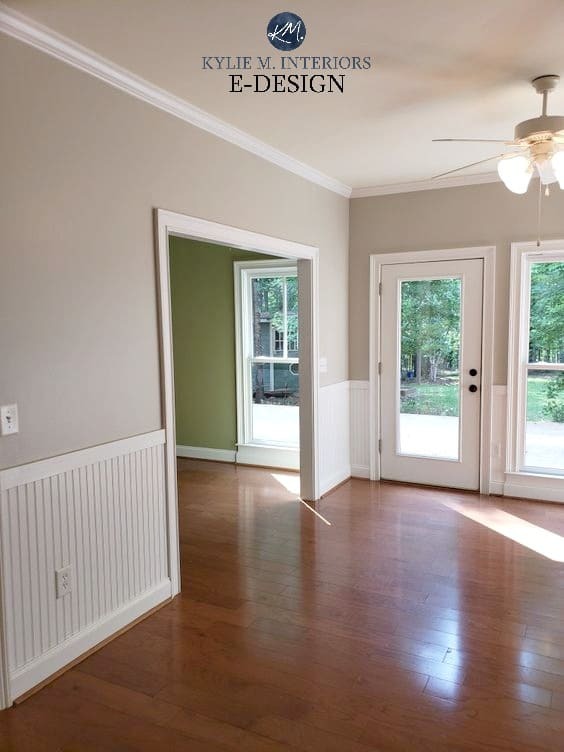 I’m concerned about a paint color that will work in my huge open space that will include dining and living. All furnishings for these areas are warm Tuscany/autumn colors. I have Surya Caesar rugs 1053 and 1029. Do you think Sherwin Williams Anew Gray will work? What if I choose a darker color for the island and great room built-ins to tie it all together? What color would you recommend for that? Drywall people finish this week…please help! We just painted all of the interior walls in my brand new home Balboa Mist. The house is west facing and the walls look lavendar! I’ve been in tears for days about it. What colors of furniture, etc. should we decorate with to make the walls look more gray and less purple? Hi Jyll! Yes, Balboa can pick up more, dare I say – feminine undertones. The first step is don’t pair it with green, which can enhance the purple look of it or warm tones (yellow/orange/red). Sometimes the key with a colour like Balboa MIst (which might make you cringe) is to choose some grays that are as neutral as possible, but ALSO pair in some grays with a very vague purple undertone. If you ignore something and it’s the ONLY THING that has it, it can stand-out. Whereas if you slightly nod toward it, you can dilute it’s impact a bit. I’m sorry you’re so sad! Is there any place you could do a feature wall or a room or 2 you could paint a bit different to shift things a bit??? I love all your posts. Always helps my life easy when making a decision. Just a little lost this time with whole house painting decision. We have an open floor plans with warm beige (w green undertones) walls, dark hardwood floors and dark stained cabinets and dark beige carport in rooms. I want to change cabinets to white ( maybe SW origami white?) and want to change Walls to gray. (Options are SW Light french Gray, mindful and repose). Which would you suggest may go well. I’m confused if Warner mindful or cooler of the repose or French might work better. In this big 800 sq ft open living area. I appreciate your help and can send a picture if needed. Need to make decision in 2 days so I’m lost. Thank you in advance. I’m considering painting my whole downstairs either SW popular Gary 6071 or Agreeable Gray 7029. I want more of a light, warm Greige instead of gray. Would one of these work? Should the ceilings be painted the same color, a deleted color of the wall color, or white. Our 2 story den is now painted in the sameness color as the walls, and looks good. Thanks for any help you can give. Hi Linda! I do try to give as much info as I can on my blog, and if that doesn’t help, it might be time for a closer look with my E-design. With personal questions like yours, where I need to see the exposure/flooring/furnishings/etc… I’m hesitant to throw an idea out as I’d TOTALLY be guessing, which won’t do you any good if it won’t work! My house is beige throughout. I repainted my maple cabinets chef white, the island dark grey, and the counters are a mostly black speckled gray and tan, then nothing looked right. I then painted the kitchen walls wine and it extends in to the living room as an accent wall. I painted the area where the kitchen table is Sherman Williams functional Gray and it looks lavender! I painted the rest of the living room Sherman Williams Agreeable Gray and it looks very baby blue! I would like new carpets and to paint the rest of the house also but am not sue what color to go with and how to make this gray work? I’m willing to paint a different gray but it seems like Agreeable Gray should have been the best choice? HELP! I just remodeled the master bathroom but budget limited my ability to replace the travertine (the bathroom is quite large). I have beuatiful greige/tuape painted vanities but when I chose the paint–oops! It’s too blue around the tube area which has the most travertine. Near the vanities and new counter tops the paint seems to blend but where the travertine is on the wall and more abundant–yuck! I used Repose from Sherwin Williams and that was clearly a poor choice. I’m slightly disappointed since I have a designer with the remodeling firm; however, color is a specialty and we didn’t really look at it in the tub area only near the vanities. If I sign up for consult should I select ensuite bathroom or just bathroom? What is the difference from a consultation perspective. Hi Michele, sorry for the delayed reply! You can choose EITHER option and you will get the same results – I’d be happy to help!